Aerial view of the site. Thanks to the Jewelry District Association and Wexford Science & Technology and CV Properties LLC for providing the documentation. Very neat, and I like the landscape design balance the buildings. I think this could fill this lot wonderfully. I love it. Anyone wanna venture a guess as to how long it will take to get this from proposal to construction? I say construction scheduled to begin Spring 2016, actually begins Fall 2016. 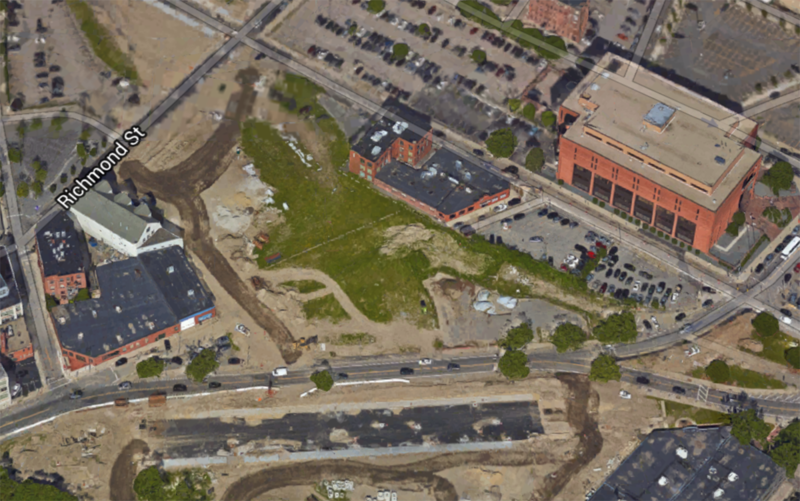 I’m not that crazy about the open space associated with this development. 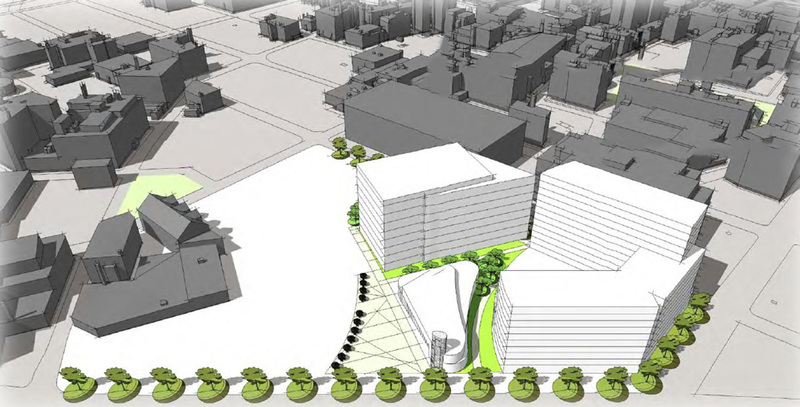 Why not complete the street wall of these lots and maximize the ground level retail activity? This is so promising. Just look at the demand in cambridge: http://www.nature.com/news/start-ups-fight-for-a-place-in-boston-s-biotech-hub-1.17721?WT.mc_id=TWT_NatureNews and the presentation says CV is the second largest property owner in cambrige, so presumably they know what they’re doing. Towne, I think the open space could be very nice. There might not be a ton of retail activity, but there’d be a lot of nooks for people to meet up, have lunch, get fresh air, etc. Also, doesn’t more open space mean they can build taller? It looks like the tallest phase one building is at least 140′. Here it is… I finally feel OK calling the Jewelry District by the name “Knowledge District” now. This is the anchor development for the entire neighborhood. 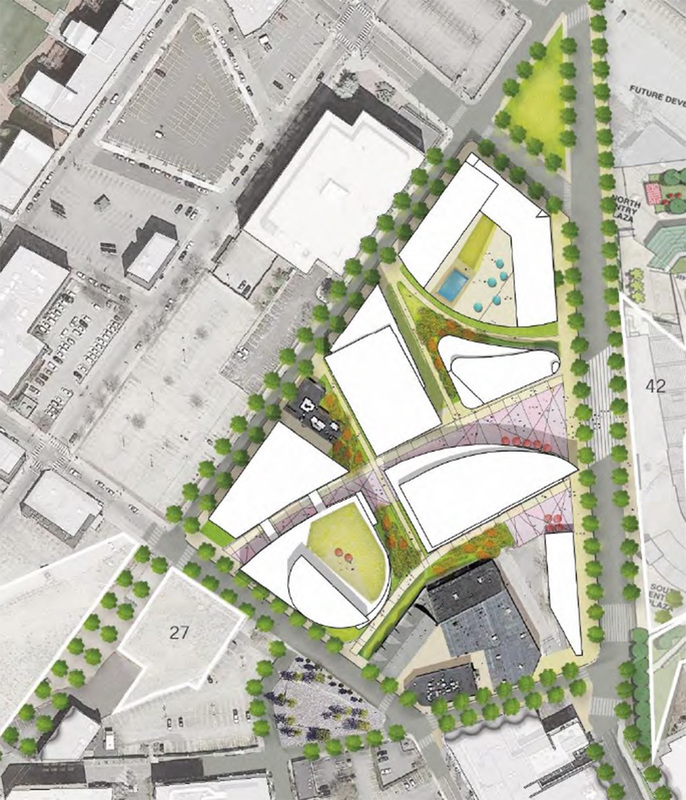 Between this and the money the colleges are putting into it, this has some real momentum here to make our own little Kendall Square in Providence. Hat tipped to the architect and developer, looks great. Perfect bridge between JWU, Brown, and the shared university space at South Street Landing. I’d like to see them add to the amount of residential units, I was quietly hoping they would be building two to three times the planned 100 units. Hopefully this development utilizes some roof space for outdoor areas like Brown did on its rooftop. It’d be a waste not to create space where you can look out onto the river and park. “Features modern design with international flair” is a slightly worrisome statement for me, but hopefully it’s nothing too boring. That aside, if there’s at least a little retail on Richmond street, fhis will be wonderful. It looks like the residential/hotel structure will top out at fifteen stories, that seems perfect for this spot, but since it’ll become such a prominent feature on the foreground of our skyline, I really hope it’s a looker. Reading the PDF, I’m having really high hopes for the architectural integrity of this proposal. So long as it’s not too dominated by glass across the board, we should end up with some gems here. Great proposal. Beautiful plan and intelligent phasing. Precedence inspiring. Love the layout of this plan, one question for me is, does the proposal of this hotel have any effect on the triangle lot hotel proposal? I guess one very minor criticism would be that I would love to see either of the Phase I lab buildings, but preferably the one attached to the hotel, designed in a less bulky/blocky way and achieve a few extra stories in height. Just for the effect it would give, y’know? I agree. The phase one building that runs along Clifford Street is too wide and squat. Lower the other sections a couple floors so that mass could go into a taller narrower tower section. That building is called out as ‘hotel/residential.’ If that were taller, and the residences were condos, the views down the bay from that height would be priceless (the views in every direction would be pretty sweet). It would be nice to see it modeled with the rest of the skyline so one could see how it looks from various view corridors. It will change the view from the river quite a bit to have any height there. What we’re looking at here is what I assume is a quite conceptual level massing model, they probably have a good idea of the volumes and massing they want/need, but these models will surely under-go a lot of revisions, especially the later phases. I agree, but they were probably trying to comply with the 120′ height limit imposed by the city zoning that the commission agreed to conform to with the development of the land. Peter, but they should be getting height bonuses for the open space and retail space. If it’s two additional floors of residential or hotel, the height might be increased to 140′. 140′ wouldn’t change the massing significantly enough for the building to read as a tower. I’m usually a proponent of height, but given the integrity of their plan, I don’t think adding a few floors will make any difference. It would be tremendous for the city if this gets built. agreed about the integrity of their plan. Hence my hesitancy to suggest any criticism at all, especially over a minor point of aesthetics! 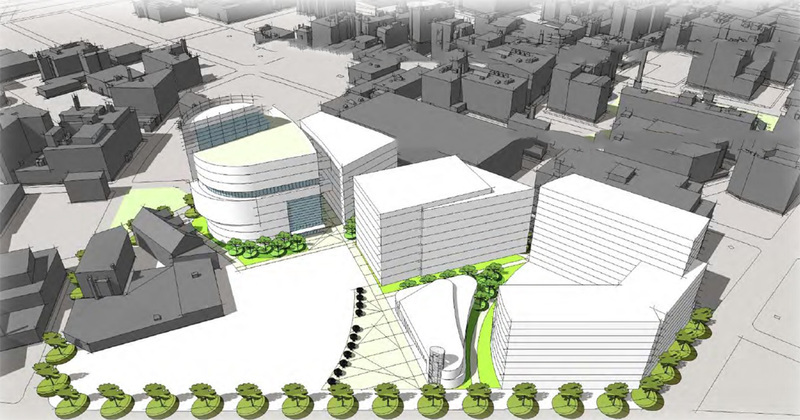 How long has Providence been working towards a proposal exactly like this? At least twenty-five years, probably more. At build-out, this proposal would be fantastic, regardless. Still, it would be nice to have a summit or pinnacle or focal point to this design, if only a handful of extra stories to give the hint of a tower. And/or perhaps something like the cube on top of GTECH, which gives just a little extra height … and, not unimportantly, advertises their presence in the city!